I am Michelle, I am the light of God's love and grace. I celebrate my life through connecting to God, The Creator of All. I create healing art and reach out to those who are seeking assistance along their journey. I seek to be the brightest, most beautiful enlightened soul & spirit that glows through my physical being. My life is about being at peace with my body, heart, loved ones, and my soul, celebrating all that I may encounter along the way. I strive to shine love and light to all I encounter. I seek peace in place of pain; I seek to encourage instead of demand; I seek to support instead of complain; I seek to love instead of hate. I surround all with love and light. I seek to be the best at living full of lightheartedness. I have asked this of God. I continue to surrender my control and celebrate what is to come. Thank you God for all your guidance, love and light. My life has been a roller coaster ride of happiness and sadness. I have the ability to discern others' experiences, relate them to my own, and see the beauty in their hearts. 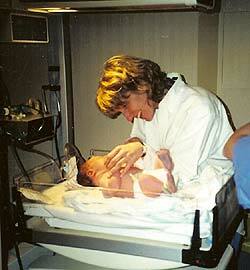 My own particular experience took a dramatic shift September 1, 2001. (For many, September 11, 2001, was their pivotal moment.) 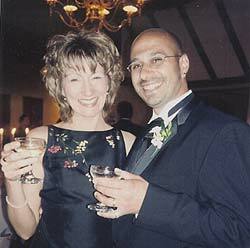 My sister-in-law and best friend, Kelly, was a huge support to me in Cincinnati, Ohio. 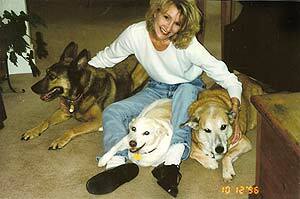 I moved from Houston, Texas, to Cincinnati in1986 to be with my husband John. Kelly and I immediately realized we had a deep spiritual bond. When we would talk about life we vibrated with intense thoughts and sharing of ideas. As we got older and life encompassed us, we took different paths. I had children and pursued my search for happiness differently. Kelly was always so caring, loving, and giving to all she encountered. She had a light that shined like a fluttering butterfly. Every time Kelly and I were together, she expressed concern regarding my unhappiness and disconnection from my heart. I allowed the outside world to weaken my faith. In 2001, my oldest son Alex started first grade and my son Zane was born. Kelly and I had been through many changes and continued the light of our friendship whenever we could. I worked at a salon as a nail technician and we found our time to support each other while pampering Kelly's soul through nails. We had standing appointments with extra exclusive time and I was excited that there was more time opening up for us to share. September 1, 2001, changed my life forever… a pivotal moment of grief, pain, change, self-awareness and enlightenment. Actually, this change began two days earlier. Kelly lovingly called to cancel an appointment with me for a manicure. Ironically, I was going to call her to come in earlier so we could have more time together on Saturday, September 1, to talk about all that had happened the previous week. She explained she was being called into work to cover another shift and she was bummed that it interfered with our plans. She said she made some decisions about her future and was excited to share her ideas and was giving me special compliments on my abilities as a nail tech. I was trying to talk Kelly into not working so we could have our time and she shared she was really disappointed to have to cancel. She was frustrated over the commitment. There was nothing I could say to get Kel to change her mind. I jokingly told her she needed to quit one of her jobs. She said she loved me and I told her I could get her in next week. The next day, Kelly called to invite me to join her for an earring making class. I told her I was excited about this because I had bought tools the previous week to create with wire and I would schedule myself immediately. Kelly said I love you and that was the last time I heard her voice. On Saturday, I went to work and filled in the time Kelly and I were suppose to share. My husband John called some time around noon to tell me Kelly had fallen down steps at work and hit her head. She was taken to University Hospital. He said she was in serious condition. I immediately thought to myself, "What is serious?" Serious is suppose to be upgraded to stable and then released in a week. They always say it is worse than it is. I asked if she was life-flighted to determine if this could be fatal. John did not know. I spent the next hour torn between my loyalties at work and to Kel. " Why?" Why did I not know my priorities? John called back saying she was life-flighted. "You need to come now." I canceled my clients and, of course, my loyalties were tested again. I allowed myself to be directed by someone else's pressure. Finally, I left the shop of crazy commitments and made my way to the hospital. I was numb and conscious of my disconnected state. I drove slowly in deep thought and told Kel that I loved her over and over. "She has to be Okay!" I was encouraging her to hold on to the people who loved her and I was trying to make sense of what was happening. "Where are my kids?" I prayed, I prayed, I prayed. I told Kel I would quit my job and take care of her the way she had taken care of me. I told her that her hubby, Dave, and John could work and I would be there for her. All you will need is rehab. "I love you Kel! It'll be Okay! It'll be Okay! Please don't leave us!" Immediately, I felt this overwhelming tingling sensation as if I was being comforted. I said, "No! No! It's bad -- you crossed over didn't you? Please come back! Oh Kel! It's too beautiful, isn't it? Please, no!" My body was shivering. She was with me, protecting and comforting. I said, "I love you Kel! I love you Kel! Please come back!" I was still in denial when I reached the hospital. I believed Kel was going to be okay. I saw family and friends devastated, in shock, and in the greatest pain of their lives. We said our goodbyes. I tried to concentrate on her hands and the presence of her spirit in the room and mourned for David's and our loss. David and Kel were true soul mates. Kelly chose Dave from afar and did not let go of him. She always spoke of Dave with love and understanding. I remember every second, every detail that unfolded - from the first phone call to finally surrendering the day to God's will. The drive home was a split second, connected to forever. "Forever! Forever! Forever!" The loss was unbearable. The sky was ablaze with the sun setting. Life goes on. It does not stop. "Please stop time!" Children needed to be fed and put to bed. I was forever changed. The pain was deep. John stayed with Dave and I continued with my everyday life. It does not stop. Friends call, there is so much love. Friends share stories of their last moments with Kel and the shock of their loss. She created an unbelievable connection with every life she touched. She truly knew God's plan. She even extended the gift of a healthy life to another human being. Her love was far reaching. I could not even imagine how I was going to make sense of this tragedy. God, Kel is so beautiful. I want to understand why this happened. "Why? Why? Why?" The physical why. What about the spiritual!! I search for answers. I pick up a book and it immediately opens to information about death. "Wow!" The healing has started. A friend shares her premonition of someone close passing, but would never have guessed Kel would be the one. "I need to make sense of this." I remember my last conversation with Kel and realize the last two days were about Kelly sharing her love with me. "I am so blessed to have had that time." I ask a friend to take the earring making class with me so that I could celebrate my friendship with Kel. Thus, the Birth of K & M Creations. The "K" is for Kelly. The designs reflect my connection of heaven and earth with Kelly and God. They include the love and beauty of our Creator. Before and After Kel's passing I was blessed with the gift of connection to Kel and all the wonderful signs a passed loved one shares to keep the channel of healing open. I know our unique friendship and interest in angels helped me see beyond the pain and open up to the wonderful gifts and abilities God gives us in times of crisis. Kelly and I were connected to a very gifted lady who was able to speak to your guardian angel. Her name is Karen Vaske. Kelly and I enjoyed the information Karen shared. I reached out to Karen after Kelly's passing. Karen encouraged me to keep my mind and eyes open for signs of Kelly‘s presence. At first, my signs were very subtle. A song that plays at the most perfect time. A book opening to a perfect message. A friend sharing a special feeling. A sister-in-law passing on her own experience of loss. If you allow yourself to see these subtle gifts, they get bigger. I was blow drying my hair sometime the week after her passing and I was crying, when the warm tingling sensation I felt on the way to the hospital told me it was Kel hugging me. I did not want to move so it wouldn't stop. I stayed with her presence for a long time and then completed the process of daily life. A simple drive over to a lost loved one's house unfolds an encounter with a deer that appeared to be running into my truck and immediately shifted into a ninety degree turn, ran with my truck, and crossed my path while I hit the brakes. The deer had a broken antler. "Thank you, Kel." Amazing, how different a person's house looks when they leave this earth. Everything has meaning. Kel had evolved. She passed me up on our spiritual journey. I am so proud of her. The next sign involved Kel‘s rings. She did not have her rings on at the hospital. We searched her house for the rings and discovered she had left them in her jewelry box. She loved her rings! Did she know unconsciously that she was leaving and protected them? The ladies Kelly worked with said Kelly was not her normal self. Did she know unconsciously she was going to leave all the people she loved so dearly and freely? " I say yes. Too many signs!" When we found the rings, I noticed a book standing up on her dresser. I recognized it because she had given me a copy of this book for my birthday. She was always inspiring me. I had not yet read it. I was eager to get home and locate a piece of my Kel. I find the book, "The Invitation". There was a note inside in her handwriting. I touch it, I read it, "Enjoy The Journey, Love Kelly". I start searching in drawers that have not been open in a long time for any message Kel may have placed for me. I need the messages to grow, to feel, to heal. Another book, "Be All That You Are". "I get it. I feel you again. You are so powerful now! I am so proud of you, Kel!" Amazing how God creates healing time for you. If it is just allowing a sleeping baby to extend his nap. I would stand on my back porch and ask for a sign and several butterflies would flutter around me. Huge unbelievably beautiful butterflies would show up everywhere. This continued for at least a year. It was a huge gift. Butterflies signify change in life. A rose John gave me prior to Kelly's passing lived for over two weeks and it dried up slowly from the outside to the center like a circular pattern. The leaves never fell and the rose is still wide open. FAITH. In the ten days after Kelly's passing, I realized that I did not want to forget this experience, so I created a book that shares in detail the unfolding of a grave loss. Kel's life was as impactive as her passing. Even a news station picked up on it. It flashed on the bottom of the screen, "Woman falls down stairs and dies". That was one of the crazier moments. However, they redeemed themselves by allowing Kels' brother to speak to them about what a great person she was. It does not interest me how old you are. I want to know if you will risk looking like a fool for LOVE, for your DREAM, for the adventure of being ALIVE. Enjoy the Journey! Happy Birthday! The WIND will call you as you gently bend and become open to the world that surrounds you. The SOIL will ground you. The WATER will nourish you, you have been planted here. The WORLD is yours to enjoy… to expand… to go wherever you want. LIFE is the gift you have been given. LOVE is the blessing you can feel. GIVE yourself some time to know who you are to become. All that you already are. ACCEPT the gifts of the new day. Be a part of every person who says hello. We are all just HEARTS …ALONE AND TOGETHER… BEATING.. to the music inside, fulfilling…our ambitions, finding…our places in the wonder of the universe. More than to hope in yourself, may you believe in yourself. In the quiet you will hear the voice of wisdom. In the stillness, you will realize your deepest dreams. And in your heart, you will know how deeply you are LOVED. Kelly's LOVE is and will always BE… It is constant. Kelly is my best friend for life. She was there for me from day one of meeting her. She took me in her heart and cherished my person. She honored my pain and supported my fears. She gave of herself unconditionally. She was my sister, my confidante, my friend. She took my pain and made it okay. She gave me a piece of her heart. She understood. She accepted me for me. I honor my love of her and she will always, always be in MY HEART. "Kelly, I love you! Dave, I love you! Thank you God for Sharing Kelly with me." As I mentioned before, I wrote a detailed book about my loss and signs. This book emerged from me for two weeks after her passing and I was panicking because I did not want to forget anything. Miraculously, the evening of September 10, 2001, I was able to finish. The kids cooperated by going to bed early and I stayed up until 3:00 a.m. to complete the book. I was vibrating with excitement and peace, so I called my Mom to share. We spoke for awhile, then we said our goodbyes. At that very moment, I know I was vibrating with Gods gifts. I felt very connected to Him. Moments later, as I was shutting the house down, I felt a lot of fear, scary fear. I did not realize at that moment, but pure evil was moving towards New York City and Washington. The next morning, I was at work when the tragedies of September 11, 2001, were inflicted upon the United States. I personally was just grasping what happened to Kel while realizing thousands of lives were taken in one instant. The way I coped with this significant tragedy was that it was not thousands of deaths, but one death and one life leaving this earth affecting thousands of lives forever. Throughout this experience, the signs continued to grow. These signs increased my faith in a higher power. I had a significant sign on a day that was the beginning of a magnificent sign. The significant sign was that I was on my back porch surrounded by several butterflies and I told Kel that she needed to contact Karen Vaske and have her call me. Of course, at the time, I was not exactly sure this would come true. Two days later and three weeks and a day from Kellys' passing, I asked my girlfriends to accompany me to Mt. Adams Street Affair, a local art show that Kelly enjoyed experiencing. When we arrived, I stepped into a booth of angel paintings that mesmerized my heart. I could not leave this booth. The booth contained paintings that were oil on canvas, oil on paper, and prints of the original paintings displayed. I immediately picked up five oil on paper paintings. I then moved to a box of prints and was drawn to two prints. The first was a very strong and vibrant angel that touched me deeply. I asked the artist, Shannon Guest, if she still had the original painting available. She shared that she was commissioned by Karen Vaske, "The Angel Lady", to paint her guardian angel. I was excited. I knew this was the sign I had asked for from Kel. I continued to flip through the prints and came across another print that had familiar colors anfid was very beautiful. I was deeply drawn to this print and I inquired about the original. Shannon said the painting was called "ANGEL MATERIALIZING" and she painted it about three weeks ago. It was at home drying. I took a step back, and asked if she was sure it was three weeks ago. She said, "yes". I asked if I could buy the painting sight unseen. She was surprised. "This is my gift from Kel!" I knew this was her. It looked like Kel and reflected all the colors we had in common in our homes. The resemblance is a mastery of Kel's spirit and Shannon's gift as an artist. 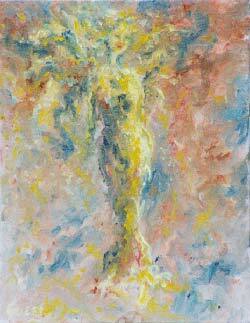 I purchased three of the five oil on paper, two oil on canvas, and "ANGEL MATERIALIZING". I shared with Shannon my request of a sign from Kel. Shannon was amazed by this "coincidence". I agreed to contact Shannon to pick up "ANGEL MATERIALIZING". Of course, I went home excited about my purchases and tried to be low key with my husband considering my investment in my "signs". I showed John the paintings and he quickly pointed out that one of the paintings looked like a woman falling. I thought this was odd and agreed with his perception. It was one of the three oil on paper. The other two oil on paper were an angel smelling the flowers and a flaming red headed angel. (I was planning to give the red headed angel to my other sister-in-law, Kathy, who was assisting me through my grief with love, information and guidance. Ironically, Kathy shared with me that her mother was the only other person to give her a red headed angel.) Kathy has red hair. Kathy's mom had passed. Referring back to the fallen woman, I spent quite a bit of time looking at the painting. The woman in the painting is reaching out to an angel above her with one arm, while falling back or laying in a bed of flowers. I found this to be interesting and wanted to share with Shannon the specifics of Kelly's passing. I called Shannon and she told me that "Angel Materializing" was painted in the a.m. of September 2, 2001, the day after Kelly passed. I also shared my discovery about the woman falling and she shared with me about the unfolding of the oils on paper paintings. The oils on paper were actually six paintings that were leading up to Kel's passing that week. She painted two fairies and three angels. One angel was bought by a woman that lives near us. I have always wondered if she had a connection to Kel. 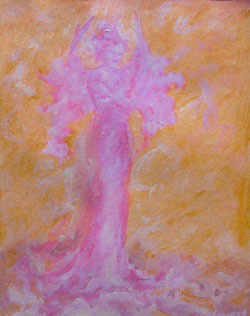 I feel this angel was Kel's guardian angel, Shannon titled this painting, "The Pale Angel". I have never researched this. The last angel painting on paper was painted the morning Kel fell, and that was the painting with the woman falling and reaching out to an angel. To add to this magnificent sign, Kelly and I shared a conversation a few weeks before her passing. Kelly was concerned about her future career and choices she was considering. She said she needed something to fall back on. I told her that was crazy. She and I talked about wanting to be taken care of and I encouraged her just to play. Kel liked making cards so I suggested she cut and paste. Once again, she repeated, " I need something to fall back on." My initial thought, was that Kelly wanted financial security. But as I soon found out, "fall back on" had a completely different meaning. Shannon and I were blown away by these unbelievable connections of gifts from one very powerful and spiritual person. This story continues with Shannon and I building a relationship of true creative friendship and respect. In the days following our meeting, we shared interest in having my guardian angel painted and she shared her interest of wanting to paint guardian angels. The connection was immeasurable. We continued our bond through my interest in all her beautiful artwork. I have surrounded myself with her paintings and we discovered and confirmed that she was painting guardian angels. It has been a very playful and giving friendship. She and I have continued our journey together and we are celebrating different unique alternative ways to connect to God. I have been truly blessed. I celebrate Shannon's unique gift. We continue to be amazed by our road of enlightenment. Life is a journey and it is up to us to find the wonderful hidden messages. Kel's passing has opened my eyes to all of God's wonderful gifts available. This experience has given me a simple and very strong faith in God. I encourage everybody to seek out there own unique relationship and connection with God. May God fill your heart with love and may you find the peace and enlightenment you are seeking. Many blessings to all.